In 1911 the catalogue of William MacFarlane & Co. of Glasgow featured a particularly elegant form of ironwork sewer vent, near identical specimens grace various parts of Bideford. MacFarlane & Co were leading producers of decorative ironwork and several of Bideford’s vents are now listed as ancient monuments. One may be seen in Torrington Street, near the bottom of Nuttaberry Hill and another almost opposite the Wooda Surgery in Barnstaple Street. 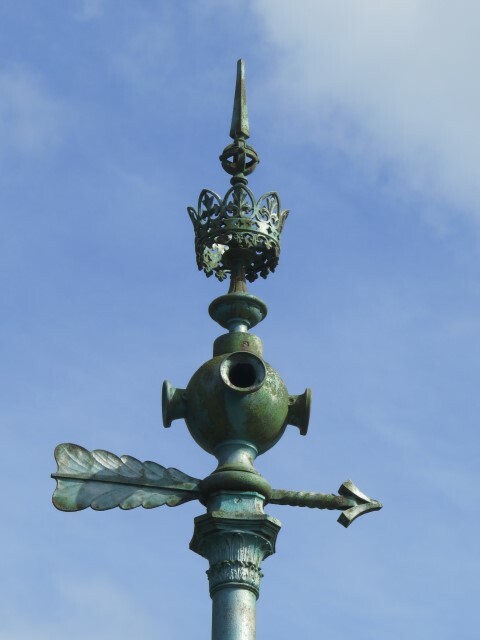 Looking like a lamppost, but with four vents and a crown on top, each has an arrow that shows the direction of the underlying sewer’s flow.